This week’s recipe for French Fridays with Dorie is a sweet, satisfying stew: Chicken Tagine with Sweet Potatoes and Prunes. It’s inspiration hails from Morocco with a mix of spices and honey. Sliced onions are softened, though not caramelized as the base of this dish. 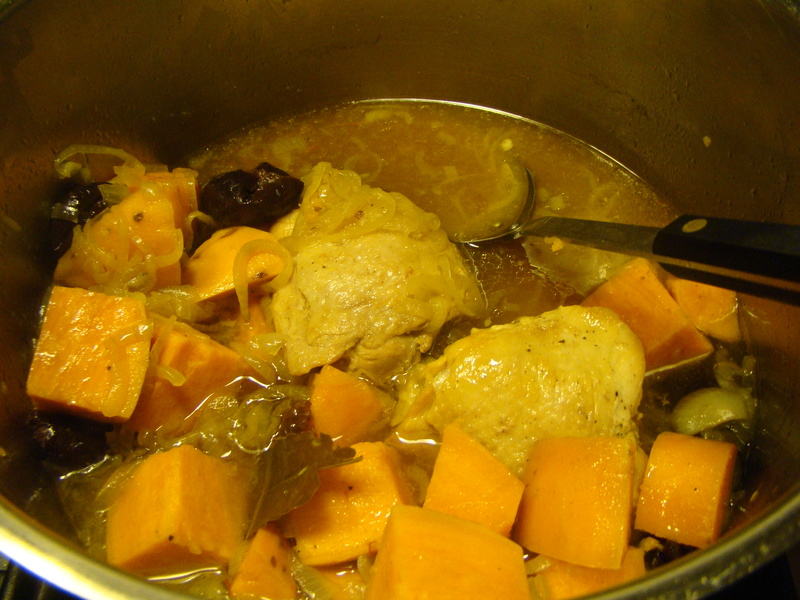 Spices, saffron, honey (I was thrilled to finally use my own), prunes, and broth are stirred in, then, topped with browned chicken thighs, and chunks of sweet potatoes. I used extra sweet potatoes. With everything nestled in the pot, the tagine is left to braise for 45 minutes, ample time to prepare side dishes AND clean up. For the non-fruit-in-savory food eater in my house (yes, Howard, I’m talking about you), it was easy enough to just not serve prunes onto his plate. No other special handling required. I served this over jasmine rice with a side of roasted cauliflower (a mix of white and orange to match the tagine). I loved the warm, sweet flavors of the vegetable mixture. I also liked the vegetables with chicken. However, we never seem to like the stewed quality of chicken with soft, no longer golden brown, skin. For the leftovers, I’m going to shred the chicken meat and stir it back into the vegetables. I will make this again, but next time, I will roast the chicken thighs separately and serve atop the vegetables, rather than adding them to the pot. That way the chicken will still be moist, but the skin will also stay crispy. That will work better at my house. We don’t post the recipes, but consider getting your own copy of the book, Dorie Greenspan’s book Around My French Table. To see how the other bloggers enjoyed their tagines, follow the links for their posts here. P.S. Amazingly, WordPress tells me this is my 300th post. I looked back, and the 3rd anniversary of my blog was on Tuesday, October 23rd. I totally missed it. In honor of these milestones as well as my first honey harvest, A Plateful of Happiness will have its first giveaway. 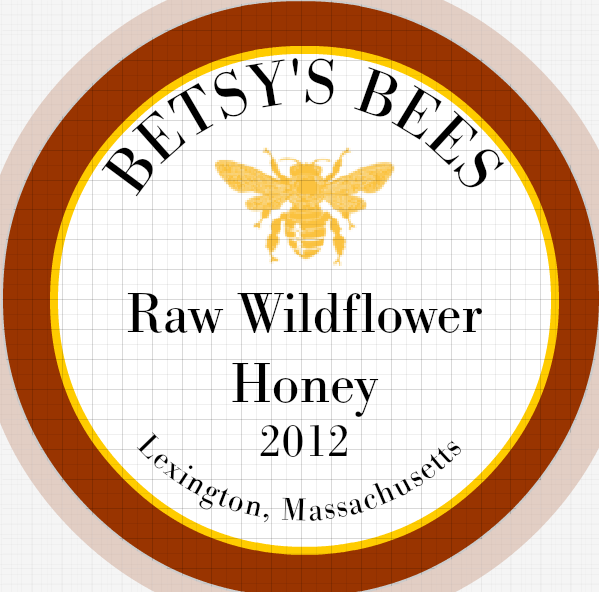 I’ll be giving away an 8 ounce jar of just-harvested raw honey from my backyard. Post a comment on today’s post before Wednesday, October 31, 2012. Be sure to include your email address where WordPress prompts you. It won’t show up with your comment, so your privacy is maintained, but I will know how to contact you if you win. Thursday, November 1, I will randomly select a winner and notify you, so I can find out where to send the jar of honey so you can enjoy it. I will also announce the winner next week. Early this afternoon, Howard sent me a “news flash” about a fast storm coming through the area during this evening’s commute. There would be snow, high winds, and possible whiteout conditions. As reported, wet snow came down in the afternoon, blowing against the windows, and then, it stopped. When I left work this evening, the sun was shining. Well, actually, it was dusk, but the sun had been shining. Shortly before I headed home, I noticed that the setting sun cast a lovely pink light on the afternoon’s dusting of snow. When I got home, Bella and I suited up for her evening walk. I put on waterproof shoes, a hat, gloves, nothing special because the storm had passed. The sidewalk was a little icier than I expected. Instead of detouring back inside for my YakTrax, I chose to just walk slowly. It was a bit treacherous in spots, but, I tried to walk on snow wherever possible, and we ambled along, enjoying the brisk evening. All of a sudden, I noticed it was cloudy again. Within seconds, I was in the middle of a snow squall, nearly whiteout conditions. I think the sudden weather change made Bella nervous. She started to walk faster, causing me to slip and land flat on my back. It knocked my hat off! The snow was blowing horizontally, and I could hardly see. We were around the halfway point, so it didn’t make sense to turn back, but we were still 15 minutes from home, under normal conditions. All we could do was barrel ahead. 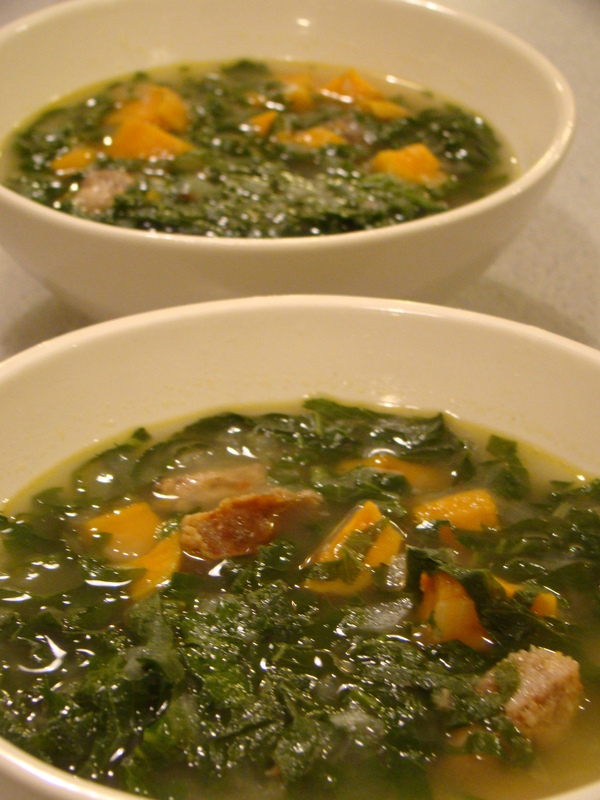 Fortunately, the plan for dinner was hot soup: Caldo Verde, a Portuguese kale soup. I had prepared most of the components the night before. I had already cooked the sausage and sweet potatoes. I had also had the base, the broth with potatoes, prepared as well. All I had to do tonight was to slice the kale and heat it all up. Howard commented on how this was the most local meal we’ve made in a while. The homemade chicken stock was stashed in the freezer. The onions and kale were from the past weekend’s farmers market, the potatoes and sweet potatoes were stored from our Winter CSA share, and the sausage was from Chestnut Farms. Roast the sweet potatoes: Preheat oven to 450F. Toss diced sweet potatoes with 1 Tbsp olive oil, a pinch of salt and some freshly ground pepper. Roast on a cookie sheet for 25 minutes. Preheat broiler. Broil sausage links on top rack, about 5 minutes per side, until cooked through. Cool until you can handle them. Slice into ½ inch rounds, and then cut the rounds in half again for half moons. Heat 1 Tbsp olive oil in a large soup pot over medium heat. Add the onions and a pinch of salt. Cook, stirring frequently, until the onions are softened, about 5 minutes. Stir in the garlic and cook until fragrant, about 1 minute. Add the stock and potatoes. Bring to a boil. Cook until the potatoes are very soft, about 15 minutes. Using a potato masher, mash the potatoes in the pot. Add the greens, sausage, and sweet potatoes to the broth mixture. Stir and simmer until the greens are tender, about 5 minutes. Add the cider vinegar, and salt and freshly ground pepper to taste. 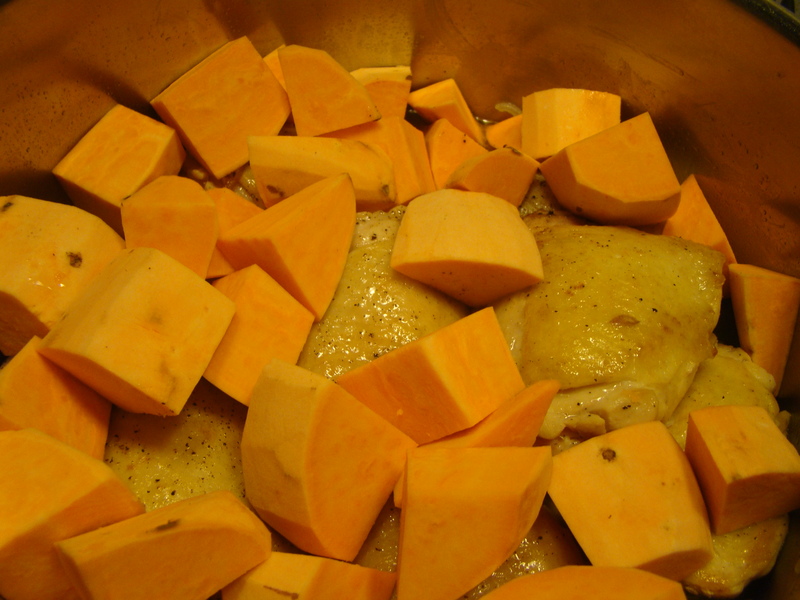 The sweet potatoes, sausage, and broth mixture can be cooked the day before and stored in the refrigerator.